WHY Choose JACKYLED Multiple Sockets Surge & Overload Protector? ☑ Safe to use. With surge protection, overload protection and lightning-proof function, our products keep your devices and your life safe. ☑ Reliable. Has RoHS, CE & FCC Certificates. ☑ High quality. Made of PBT fireproof material, they are heat resistant and durable. ☑ Quick charge. USB ports(Max 2.1A) are for mobile phones, cameras and other digital devices. High conductive copper ensures smooth conduction. ☑ Strong compatibility. 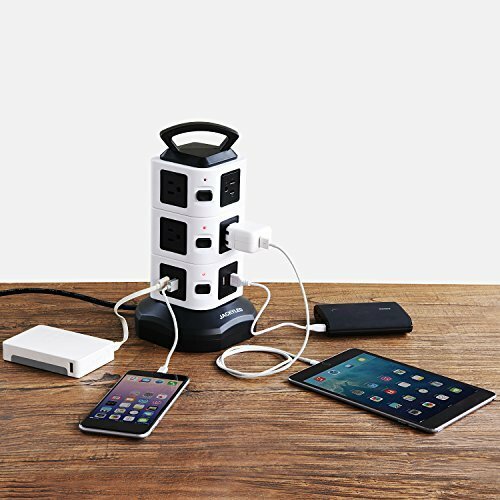 Can charge many devices and appliances at the same time. Max 3000W. ☑ Special design. One control button at every layer, bright light led indicator, low carbon, energy saving & easy to use at night. ☑ Strong carrying handle. Convenient to carry and eliminate the risk of electric shock hazard when the products are moved to another place. ☑ Space saving. 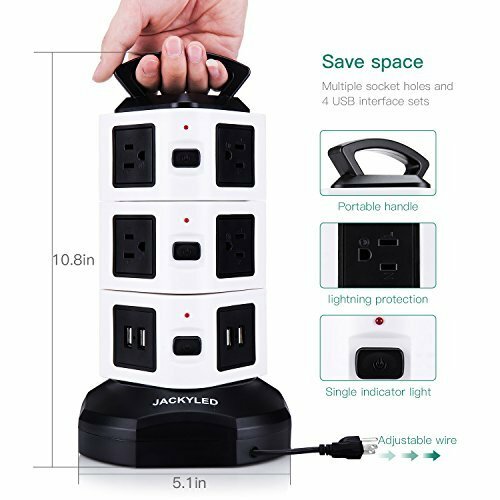 1 JACKYLED Power strip tower with 10 Outlets and 4 USB ports, a perfect power strip charging for most electrical devices at the same time. No need 2 or more power strips to charge your devices. Retractable cord also saves space in your working area. YOU MAY NEED TO ADD SOME STRENGTH WHEN YOU PLUG IN OUR POWER STRIP TOWER. It is our special design that the plugs are tight in order to prolong the life-span of the product. And you may need to add some strength to get plugs in at the previous period. After used for some time, it will get a little loose for your plugs. It is a normal phenomenon. So please rest assured on our product. MAX WATTAGE: Due to different voltages in different areas, this surge protector tower is designed to support 110V-250V. If it is used under 125V, the max power will be 125V x 13A = 1625W; if under 250V, the max power can reach 3000W. 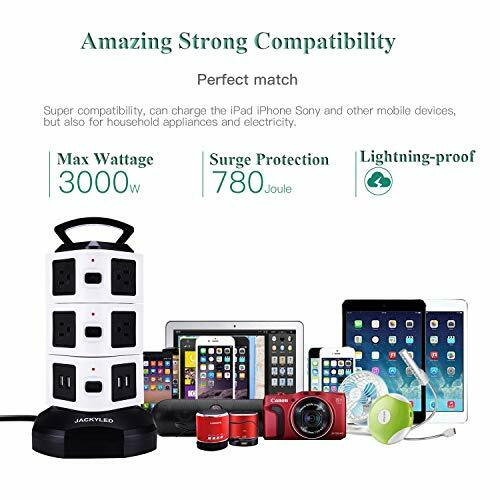 This Surge Protector（780Joule, 13A） with 10 outlets and 4 USB Ports has large compatibility that can charge various appliances and devices at the same time to meet your power demands with safe guarantee. 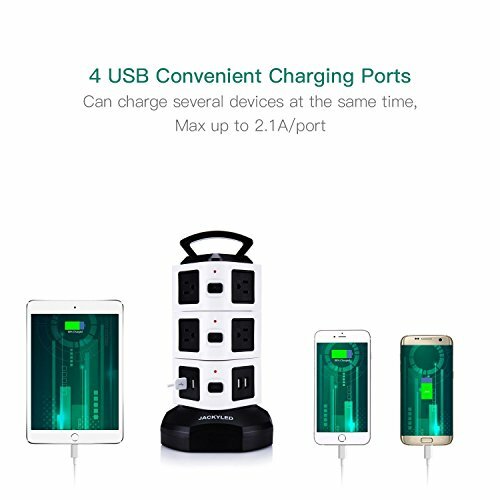 CONVENIENT USB PORTS: The 4 USB ports (Total 5V/2.1A) can charge two cellphones together, or one iPad, MP3, digital camera, tablet etc at fast speed. Max Output current per port is up to 2.1A(Note: USB charging may not work if the total need exceeds 2.1A(long time over-current of 2.1A above can even lead to broken USB Ports), and please search for B0759TZDWZ or B0753LL2R6 if you need more USB current. Their total USB Output: 8A, max up to 2.4A/port). SAFE & RELIABLE: RoHS, CE & FCC Certificates. This electric power strip outlet is lightning-proof, overload protected and surge protected and has a fire-retardant shell. It will automatically cut power to protect connected devices when voltage surge is detected. 4 SPECIAL DESIGNS: Vertical outlet tower design provides enough space for each outlet, saves much space and cleans various cords in your working area comparing to traditional power strips; 6ft long cable wire at the bottom can be extended anticlockwise or retracted clockwise by rotating the tower, which saves space; A durable handle on the top is for your easy carrying; One switch at each layer helps save power and gives an easy control to the power strip surge protector. SATISFACTION GUARANTEE: 100% satisfaction guaranteed. 60 days changing or refunding without reasons. 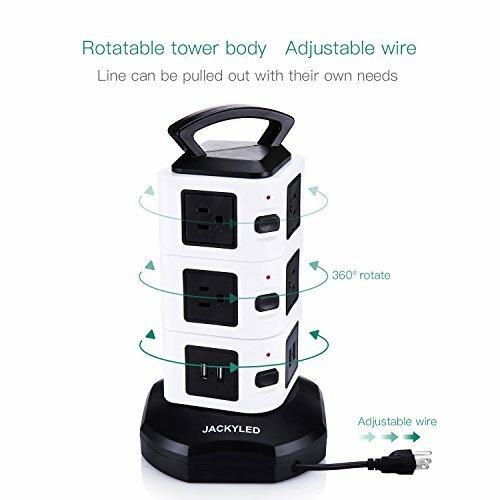 JACKYLED Products are sold and shipped by Jackybrand. If you purchase a product from another seller, please request a refund as it is a counterfeit. JACKYLED is the only Authorized Dealer of Jackybrand products.